Got the big MC on the water tossing some ultralite action. Braiding up the pannies on grubs like its 1999. We waded a bit and found some slower, but consistent action. Mike made the right choice to seek creekmouth, we got into a bunch of hard fighting 12-14" slabs. Saw a bald eagle flying overhead and briefly contemplated the eagle attacking some canadian geese in a cage match. Gonna have to go to the 8/1 braid for this kind of fishing. I had fished for 3 hours in the AM rain. Totals were better today on the bigger white bass with many 12-14"ers. 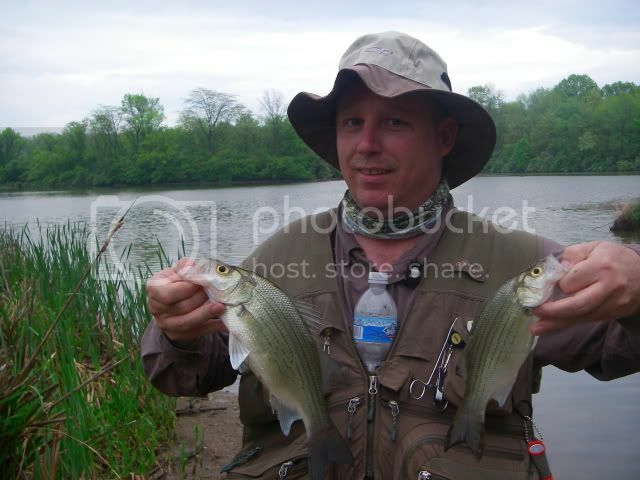 Mike had close to 30 fish in the 3 hours we fished. We had a blast. Fishing for smallies definately good training for river run panfish in cover. That must be a blast, getting into a mixed-bag of fish like that. 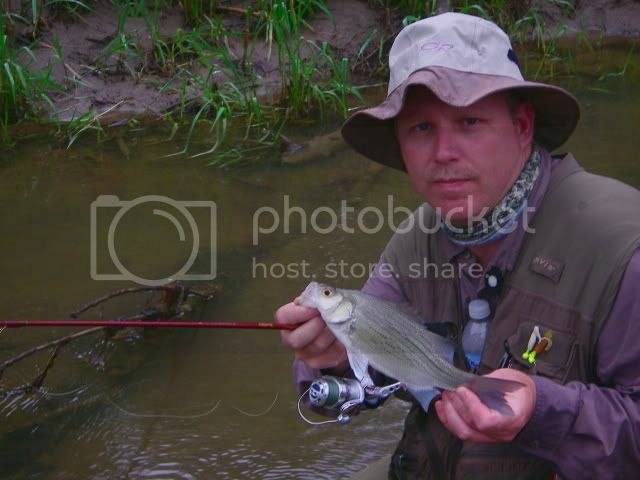 White bass are especially fun on light gear. Uh oh, two of these outings in a row? The smallies are getting jealous I bet. Looks like fun! I hit one of the two creeks again for a few hours each of the last couple days. 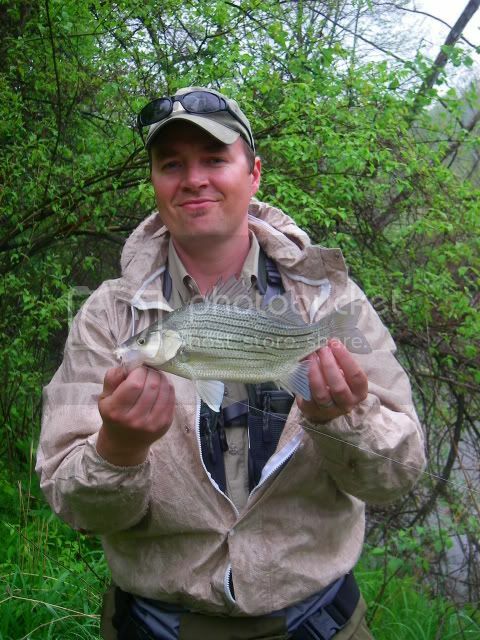 About the same level of success with a better % of White Bass. I learned to leave the crappie spots alone. Jeff, it is a load of fun and just when I should leave the smallmouth alone anyway. Thought you guys would get tired of reading about gobs of panfish. 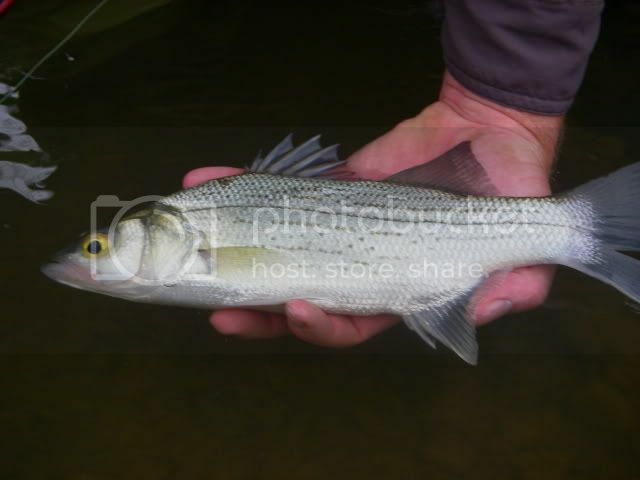 Most man made reservoirs in Indiana seem to have a White Bass run up the north end of the lake out the creeks. Ben, water has been up with the rains and smallies are in the midst of spawning themselves. I'd be surprised if Illinois and Wiconsin didn't have similair reservoirs and feeders.